Enter the script to use. In the above example, each source document from the 'Products' collection will be sent to the 'ProductsInfo' collection in the destination database db3 (which is external to the cluster). Each new document will have 2 fields: 'ProductName' & 'SupplierName'. 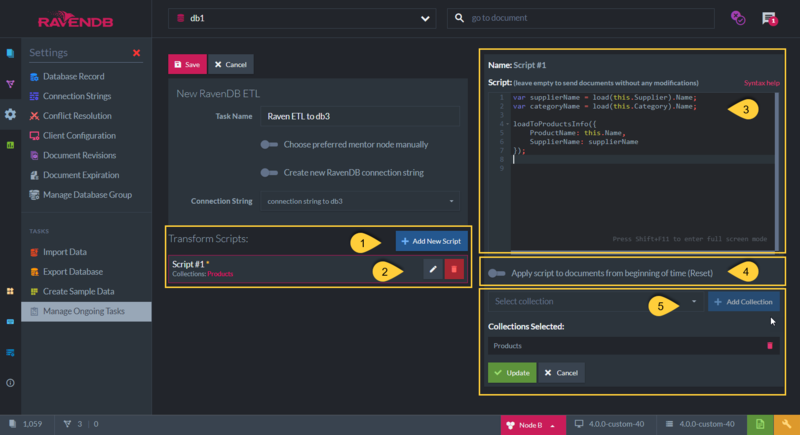 For detailed script options see Transformation Script Options. By default, updates to the ETL script will not be applied to documents that were already sent. rather than apply the update only to new or updated documents. thus, a new Ongoing RavenDB ETL Task cannot be scheduled. then the task will not be active, data will not be ETL'ed. 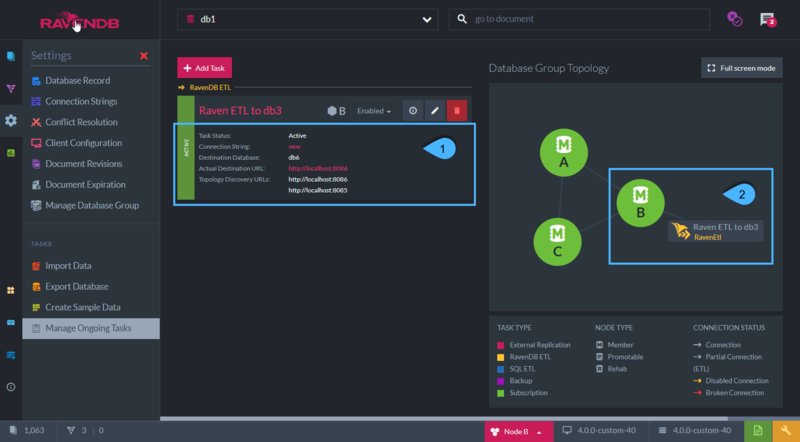 then another node from the Database Group will take ownership of the task so that the ETL process will continue executing. The ETL process will wait until the destination is reachable again and proceed from where it left off. If there is a cluster on the other side, and the URL addresses of the destination database group nodes are listed in the connection string, then when the destination node is down, RavenDB ETL will simply start transferring data to one of the other nodes specified. When a RavenDB node performs an ETL to another node it is not replicating the data, it is writing it. In other words, we always overwrite whatever exists on the other side, there is no conflicts handling. The source database for the ETL process is the owner of the data. This means that any modifications done to the ETL’ed data on the destination database side are lost when overwriting occurs. If you need to modify the ETL'ed data in the destination side, you should create a companion document on the destination database instead of modifying the ETL’ed data directly. On the other hand, Data that is replicated with RavenDB's External Replication Task does not overwrite existing documents. Conflicts are created and handled according to the destination database policy defined. This means that you can change the replicated data on the destination database and conflicts will be solved. With replication Task, all documents contained in the database are replicated to the destination database without any content modification. 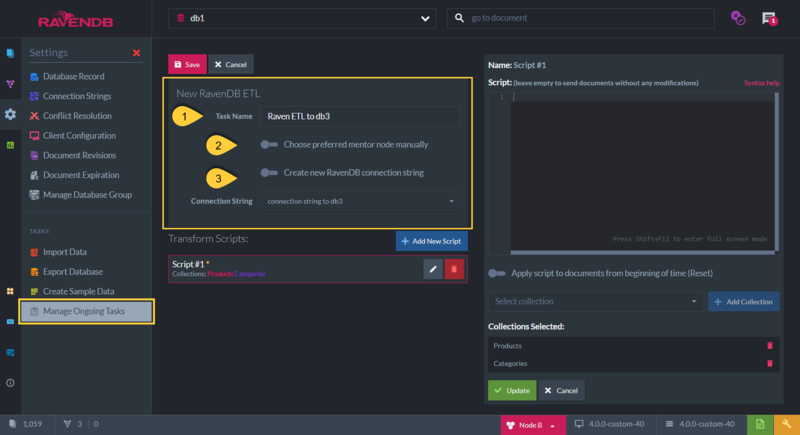 Whereas in ETL, the document content sent can be filtered and modified with the supplied transformation script. In addition, partial data can be sent as specific collections can be selected.